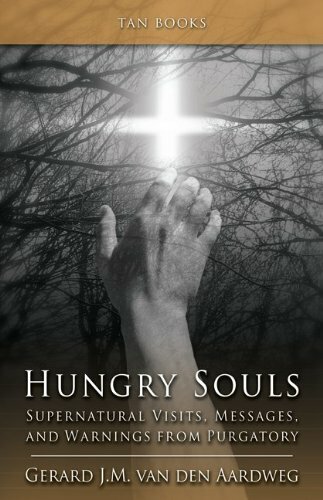 Hungry Souls is a wonderful testament to the reality of Purgatory. The author, Gerard J. M. Van Den Aardweg, has compiled a very honest, heartfelt account of the plight of the Holy Souls, written in a simple language, easily accessible to all. And in my opinion, it is extremely successful. For after reading this book, one is left with a deep impression of the reality of the suffering existence of the souls in Purgatory and a longing to help them. This work is like a mosaic of thoughts and ideas about Purgatory. And it could therefore be considered a compendium or anthology. For, throughout, Van Den Aardweg draws upon many sources: the writings of Saints and Church Doctrine, as well as from theologians, Popes and lay witnesses – all who illumine the reality of Purgatory. And in so doing, he reinforces, in the mind of the believer, the importance for us to pray for these poor suffering souls. The book begins with a short summary of the nature of Purgatory. The author then details certain personal accounts of near-death experiences and visitations to people by poor souls. Carefully, he chooses to include only those experiences that he deems trustworthy. The book, then, aims to verify that these phenomena are real. For although the author seeks to enable understanding of Purgatory, he also wants to convince sceptics and non-believers of its reality. Whilst containing much that is rich, insightful and moving, this short book turns on three key ideas. Firstly, that it is real and true that purgatory exists. Secondly, that it is real and true that certain poor souls have visited the living and implored help, providing proof to the third fact, that they truly suffer and desperately need our help. These ideas echo again and again throughout the text. The author’s selected accounts only strengthen his argument, making more real the fact these poor souls exist, that they suffer and that they come to us to plead for help. The revelations she received about the sufferings of these souls, about our Divine Lord’s tender love for them and His eager desire for their deliverance, of the great efficacy of the devotion to the Sacred Heart for their early release, and the fact that [she] combined these two devotions so intimately … indicate that there is such a close connection between the two devotions that the devotion to the souls in Purgatory may be said to form a part of the devotion to the Sacred Heart. The church is a monument in honour of the mercy of the divine-human Heart of Christ for the souls in Purgatory, and at the same time, an invitation to the faithful to practice charity for them in union with His merciful Heart. Housed within this church is a small and unusual collection of items, known as the Piccolo Museo del Purgatorio (Little Museum of Purgatory). Later in the book, the author devotes a chapter to the items displayed in this collection, showing how the Holy Souls appear to the living and the customary burn-marks left from their visits. But let us stay with the first chapters, where we find accounts from people who have either witnessed death themselves or received visitations from those who have died and are suffering the fires of Purgatory. Van Den Aardweg uses a vivid near-death experience to illustrate that which tradition affirms about Purgatory. This is to say that, immediately on death, the soul experiences a powerful light. This light, seen as an image or symbol of God, is everything the soul has ever longed for. But the soul then retreats quickly from that light – to a place removed from it. It is a place where the light is continuously experienced in some way, constantly reminding the soul of that for which it yearns. This retreating from God, in the form of this light, is necessary for each particular soul. This is in order that the soul suffers its just judgement, according to its sin, in the purificatory fires of Purgatory. Yet, whilst this suffering fire is difficult, that which is far harder to bear is the separation from the light itself. The souls experience a deep, unbearable longing to be united with the light, with God. Suddenly, I saw the complete condition of my soul as God sees it. I could clearly see all that is displeasing to God. I did not know that even the smallest transgressions will have to be accounted for. What a moment! Who can describe it? To stand before the Thrice-Holy God! ‘You are guilty of one day of fire in Purgatory’. I wanted to throw myself immediately into the flames of purgatory, but Jesus stopped me. St. Faustina transmits the awfulness of the soul’s confrontation with the Eternal, its insight that perfect holiness is required before it can enjoy God’s presence … and the instinctive impulse of the soul to be cleansed, even in the flames of Purgatory. The author then deepens and extends this idea, bringing in a different perspective from the writings of St. Catherine of Genoa. St. Catherine of Genoa apparently experienced the purificatory fires herself, whilst still living. She encountered the Holy Souls and their suffering, face to face. She saw how they came before God, immediately on dying, but were then filled with such guilt and shame – due to their imperfections – that they could not bear to remain in God’s presence. The purificatory fire burns to cleanse the soul of these imperfections. According to St. Catherine of Genoa, this fire is the only place these poor souls want to be. For once cleansed, they will be pure in the face of God and then be able to enjoy the eternal banquet. She therefore saw that the souls are content to suffer the fire – for they know it is the only way they will come to be with God. The fire is seen, therefore, as God’s love. He has had mercy on their souls and provides the means for them to be reunited with Him. The fire of Purgatory, which comprises the sufferings of the ‘pain of loss’ and the ‘pain of sense,’ is the fire of the love of God enkindled in the soul right after death. Then it sees itself and all its ‘rust of sin’ – which St. Catherine specifies as ‘the lower self in us…hidden flaws…[the soul’s unpaid] debt’ –in the light of God’s Presence. Because she saw that the fire of purgatory was God’s merciful love, purifying each soul, she experienced that fire as joy. [The soul is] immersed in charity, incapable of deviating from it [and] can only will or desire pure love. There is no joy save that in Paradise to be compared to the joy of the souls in Purgatory. This joy increases day by day because of the way the love of God corresponds to that of the soul, since the impediment of that love is worn away daily. St. Francis de Sales was highly respectful of St. Catherine’s thoughts on Purgatory. As the author notes, he deemed them, ‘wonderful and very seraphic’, ‘pure inspiration and divine enlightenment.’ In fact, St. Catherine of Genoa became known as the Theologian of Purgatory. Whilst attempting to show how poor souls from Purgatory do indeed visit the living, Van Den Aardweg alerts people to the danger of being deceived. For souls can appear whose intentions are far from holy. He warns, then, of the many manifestations of spirits claiming to be dear deceased friends or loved ones, where in fact they are anything but. I … came under great pressure when I saw the sorrowful expression, the supplicating raised hands and the torrents of tears flowing from the eyes, and moreover heard sounds and sighs of anguish, desperation and supplication that would have softened a stone. Whilst Protestants do not believe in Purgatory, the notion of these supplications ‘that would have softened a stone is only natural to we Catholics, almost instinctual to our very nature. In exploring these themes, Van Den Aardweg considers how they have emerged in human thinking over the centuries. A moving early Christian account of a manifestation of a ‘poor soul’ … in the Acta of the martyrdom of St. Perpetua described by the young martyr herself in the year 202, during her stay in the dungeon before she and other Christians were thrown to the wild animals. In a vision she saw her deceased seven year old brother in a pitiful condition, in a gloomy place “with many others, flushed with heat, and thirsty.” There was a basin full of water, but its edge was so high that the boy could not drink. St. Perpetua’s prayers had ‘made good’ her brother’s wrong-doing and are an example to us of the efficacy of prayer for the Holy Souls. The souls in Purgatory pray for us so that we may recognise our sins and that what we do for them will be rewarded a hundredfold. And so St. Gertrude the Great specifically formulated a prayer for releasing the Holy Souls in Purgatory (here). They were praying fervently, but without effect for themselves; only we can come to their aid. Since that time, I am in closer communion with the suffering souls. In fact, St. Faustina continued the work of St. Gertrude, using her special prayer to aid the release of the Holy Souls from Purgatory. Trent dogmatised what had been believed all along. First, although the guilt of a penitent sinner may have been forgiven, that does not mean that automatically all his “debt of temporal punishment” is discharged. In short, he may have to do penance in order to be purified, whether in this life or in the next: in Purgatory. Furthermore, the souls in Purgatory ‘are helped by the suffrages of the faithful, but particularly by the Sacrifice of the Altar’. Since early Christianity, there has been unanimity that offering the Sacrifice of the Altar to the holy Trinity is the most beneficial suffrage for the poor souls. Poor souls indeed very often ask for holy Masses; but an expiatory act of high value is also the offering up of holy Communions, even of so-called spiritual communions. Furthermore, prayers, alms, indeed all acts of charity and all and every ordinary daily work; all mortifications and sacrifices that are offered to God for the relief or release of the suffering souls. In a very moving account of a widowed woman, visited by the Holy Souls, we find many examples of this. The lady was asked by the Holy Souls to offer prayers and sacrifices, according to the particular soul’s needs. For example, one soul asked for three Rosaries a day, another just one. Another soul had greatly sinned by avoiding good deeds, so asked for good deeds on his behalf. The widow offered these very prayers and sacrifices and was greatly rewarded, by the souls’ liberation from Purgatory. She was also rewarded by news of her son – for she had been very concerned about her son’s fate, after his death, during battle. You have always asked how it is with your son Jacob. You need not worry about him. This one is already altogether on high. He was lying a whole night in a shell crater, severely wounded. Then he called upon Jesus, if he might put his wounds in the wounds of Jesus. That way he dies. His guardian angel was permitted to bring him up straight away. His death was a death of sacrifice, taking part in the sacrifice of Jesus. Dying is beautiful if you love Jesus. This is, of course, our goal, to love God with all our hearts, minds and souls. The greater our love for God, the easier it is for us to recognise and therefore avoid sin. The call to love God naturally awakens a greater capacity for the recognition of sin and the consequential amendment of our lives. The souls in Purgatory pray for us so that we may recognize our sins and that what we do for them will be rewarded a hundredfold. Gerard Van Den Aardweg concludes his book with a remarkable testimony that only further amplifies these things. It concerns a young nun in the Ninteenth Century, whose recently-deceased father visited her regularly. He seemed a grumpy, ungrateful soul. He frightened her, causing her to greatly suffer and continued badgering her for more prayers and sufferings on his behalf. Yet, apparently, the father’s horror of purgatory was so intense, that even though he only had to endure it a short while, his suffering seemed unbearable. But this was not the only reason he badgered his poor daughter. He did not want her to suffer these flames of purgatory and therefore saw that if she suffered for him now, her own time there would be lessened or removed altogether. Yet, there is still more. On the day that he was released from purgatory – due to her prayers and sufferings – he appeared to her resplendent and beautiful and told her he would pray for her. His prayers would be far more efficacious, as he was now enjoying the company of the Saints in Heaven. My punishment is ended. I come to thank you and your community for all the prayers said for me. From now on I shall pray for you all. He was so resplendent that her eyes could scarcely bear the dazzling light. Her joy and happiness were now supreme. She felt ineffable peace of soul. The fact that this young nun experienced such peace of soul, highlights the sense of rightness in what she had done by praying and suffering for her deceased father. It speaks of relationships and responsibility. Just as we have responsibilities in life, for our children, spouses, parents, etc, we also have those same responsibilities in death. And these responsibilities are gifts from God. They may be difficult; they may be joyous, but they all bring greater life-experience and opportunity for coming closer to God. In this last account, the nun’s acts of suffrage for her father brought about such a longing for her to be united with God that it transformed her life. It seems that the Holy Souls appear, first and foremost, to implore our help on their behalf. But, just as relationships in life are complex and multifaceted, so they remain after death. These acts of prayer and sacrifice, on behalf of the Holy Souls, help us more than we can know. They help our own deliverance, by aiding us to grow in our love of God. They may cause us to suffer now (perhaps in a way that is more graceful) those impediments that will keep us from our heavenly goal, at our own death. This simple book has impressed me deeply and catalyzed me into a daily relationship with the Holy Souls, where I offer prayers and sacrifices. I am very grateful to the author for giving me this opportunity to extend myself beyond the here and now, to that other world in which many of us will find ourselves one day – Purgatory. This entry was posted in Reviews and tagged Holy Souls. Bookmark the permalink. Post a comment or leave a trackback: Trackback URL.